The Academy Library is thrilled to announce “Facendo Il Libro: The Making of Fasciculus Medicinae, an Early Printed Anatomy.” This online exhibit, focused on an astonishing and influential medical book first published in Italy in 1491, was made possible through the generous support of the Gladys Krieble Delmas Foundation. Originally collected in manuscript form, the Fasciculus Medicinae (the “little bundle of medicine”) is a richly illustrated collection of medical treatises on uroscopy, phlebotomy, anatomy, surgery, and gynecology. The Fasciculus Medicinae was first published in 1491, but demand for it made it a favorite text for printers. By 1522, it had been issued more than twenty times. Variations in the text and the illustrations through time show the early modern tension between medieval medical ideas and advances in medical understanding forged at the beginning of the 16th century. The exhibit allows visitors to browse full-text scans of all five editions (1495–1522) in The New York Academy of Medicine’s collections; to investigate each edition’s exquisitely illustrated woodcuts and to explore their cultural and medical meanings; and to compare the books’ illustrations in different editions over time. The site includes contributed essays from Dr. Taylor McCall, art historian of material culture and medieval medicine at the Walters Art Gallery, Baltimore, and from Dr. Natalie Lussey Seale of the University of Edinburgh, whose work focuses on early modern Venetian print culture. Dr. McCall’s essay looks at the creation of the text and its accompanying illustrations, while Dr. Seale’s essay offers a window into Venetian printing processes in the 16th century and describes the making of a book in early modern Italy. The illustrations of the Fasciculus Medicinae offer an intriguing glimpse of medical practice in the 16th century. The book’s woodcuts include narrative scenes depicting the earliest Western depiction of dissection in print, an early illustration of a diagnostic consultation showing a professor analyzing a urine flask, and a physician, holding an aromatic sponge to his nose to avoid infection, attending a sick plague patient confined to his bed. Other woodcuts help us to understand early modern conceptions of health and illness. The Fasciculus Medicinae’s female anatomical figure captures late medieval ideas about women’s bodies, reproduction, and pregnancy. A “Wound Figure” graphically depicts the various threats to the body, from blows to the head down to the prick of a thorn on the feet. Perhaps most surprising of all, the Fasciculus Medicinae’s “Zodiac Figure,” who balances all twelve zodiac signs on his body, conveys the powerful role the stars and planets played in health in the medieval imagination. This figure, who dates to earlier manuscripts from the medieval period, survives well into the twentieth century, appearing alongside horoscopes in a modified form in print in American almanacs produced by pharmaceutical companies. The Facendo Il Libro website has a simple design, but a complex structure. It is both a standalone digital collection and an online exhibit built using Islandora, an open-source digital repository framework. Representing the first full-text internal digitization project for the Academy Library, the five editions of the Fasciculus Medicinae were digitized in the Library’s Digital Lab. The online exhibit was built using an Islandora multi-site to leverage the digital collection repository (Fedora), Drupal Book module, and the current Library branding theme. The ability to draw from the common repository made it possible to store content once and use it in multiple ways. Thus, the five digitized editions are available in two different places using a single source. The built-in navigational structure for the exhibit makes it easy for users to explore the collection in a linear fashion or by sections. Replicating the physical experience of touching the text is still a challenge for digital projects. Thus, it was important to create a digital experience that provides the user with some sense of the materiality of the object. For example, the 1500 edition was bound with another text (Savonarola’s Practica medicinae), which is evident from the first digital image of the book. The image shows the thickness of the text and the fact that the 1500 edition begins in middle of the physical object. It shows the user exactly what will be encountered when using the physical item. It also highlights a significant piece of information that could have been lost due to cropping. Another important aspect of the online exhibit is the illustrations page, where users can see all the illustrations from all editions in one place. When a user clicks on an illustration, the user is immediately taken to a page with descriptions of each illustration as it appears in each edition. To explore the images, users can click on an image and zoom in to see the intricate details. “Facendo Il Libro: The Making of Fasciculus Medicinae, an Early Printed Anatomy” offers a great opportunity for users to learn and explore the Library’s five editions of Fasciculus Medicinae in context. Explore Facendo Il Libro Online Exhibit. Did you know that required trademarks go back to 1266? In England, bakers were required by parliament to use a distinctive mark on the bread they sold. [i] Fun design/history/bibliographic fact, the Drs. Barry and Bobbi Coller Rare Book Reading Room here at the Library features trademarks in its décor. More specifically, the room’s chandelier have printers’ marks. As an homage to book history and the art of the book, the chandeliers of our reading room are decorated with printers’ marks. I got to know these marks beyond “those pretty design bits on the lights” when we created special bookplates (another age old way to ‘mark’ your stuff) for Adopt-a-Book donors. The virtual bookplates that donors receive features four of these marks keeping them connected with the legacy and art of the book. Our incredibly talented graphic designer sharing sample sketches for the adoption bookplates; artistic inspiration courtesy of early modern printers, the architecture of the rare book room and the Academy building. As the name suggests, printers’ marks are a device or emblem, like a logo, that early printers used to make clear the source of the item. According to Printer’s Marks, the first of these is Johann Fust and Peter Schöffer’s Mainz Psalter of 1457. Among the best well-known of these old printers’ marks is one that you will find on our library’s custom designed chandeliers and on our adoption bookplates (upper righthand corner) the device of Aldus Manutius: the dolphin and anchor. Next to Aldus in the upper left corner of the bookplate, the ethereal hand manipulating the compass with the Latin motto Labore et Constantia (Work and Constancy) belongs to Dutch publisher Christophe Plantin (1520-1589). During his life, he used a large number of devices and they could vary in appearance. There are three primary types; the first features a tree and the second a scroll with a Latin motto twined around a grape vine; the third is the hand and compass and first appeared in 1557. [ii] The compass is symbolic of the motto: the leg of the compass turning around is work while the stationary point is constancy. Below Plantin’s mark on the lower left, is the printer’s mark of Paris printer and bookseller Poncet Le Preux (1508 – 1551). His initials P L P are ‘tethered’ together by a tasseled cord. Lastly, the monogram in the lower right corner of the bookplate that also adorns our chandeliers belongs to Badius Ascensius or Jodocus Badius (1462 – 1535). Originally from Flemish town of Asche, he set up a print shop in Paris, Prelum Ascensianum, in 1503. The initials in the monogram are I V A B, the A and V intersecting to form the diamond shape at the center, which stand for his Latinate name Iodocus Van Asche Badius. We invite you to come look at these gorgeous marks on the chandeliers and in the books themselves at our First Monday tours. The first Monday of every month at 12 pm we do a free tour of the Rare Book Room. Or adopt a book in our collection and receive a copy of these marks in the custom designed donor bookplate. Bonus mark! This is the mark used by Badius’ printing house, Prelum Ascensianum (his monogram featuring at the bottom center, the shop’s name visible on the center crossbeam of the press itself) and my personal favorite because it is a printer in action. [ii] Roberts, William. Printer’s Marks: A Chapter in the History of Typography (New York: George Bell & Sons, 1893). 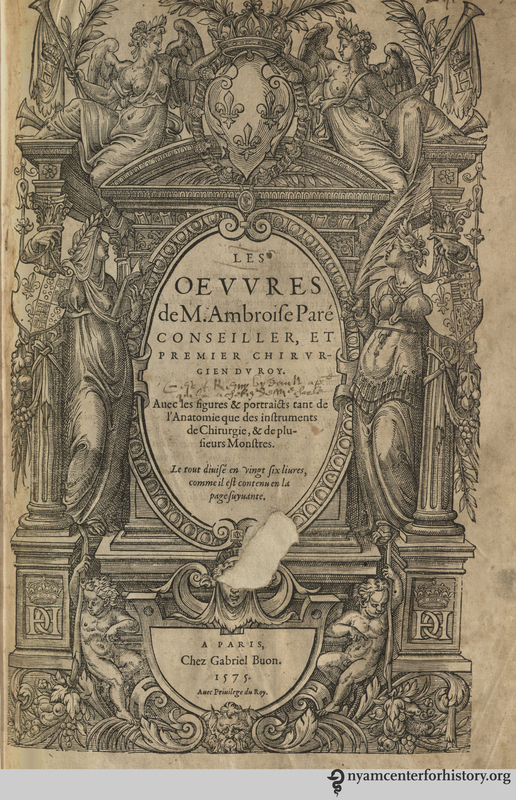 The August item of the month is Ambroise Paré’s (1510 –1590) Les Oeuvres, or Works. Published in 1575 in 26 sections or books, the folio volume has 295 illustrations and includes Paré’s writings on anatomy, surgery, obstetrics, instrumentation, and monsters. This post focuses on Paré’s military surgery and is the first in a series of occasional posts looking at the relationship between medicine and war. Frontispiece of the first (1575) edition of Les Oeuvres, dedicated to King Henri III. Click to enlarge. Dedicated to Henri III, Paré presents Les Oeuvres as an accumulation of his life’s studies and experience, and it incorporates many of his earlier publications. The French barber surgeon spent much of his life at war, serving in over 40 campaigns, and published numerous highly influential books, many of them directly based on his practice of military surgery.i Paré’s career was a prestigious one, progressing from working as an apprentice barber surgeon to great prominence as surgeon to Henry II, and subsequently his successors Francois II, King Charles IX, and Henry III. Like his contemporary Andreas Vesalius, Paré is now celebrated as an emblematic figure of Renaissance thinking, willing to look beyond the established authorities and instead rely on the evidence of his own experience. In the Oeuvres, for instance, he mocks the use of “mummy” or “mummia,” a popular remedy ostensibly created from Egyptian mummies and used extensively by physicians.ii Such a position was particularly provocative given Paré’s identity as a surgeon, rather than a university trained physician with a formal education and knowledge of Greek and Latin. 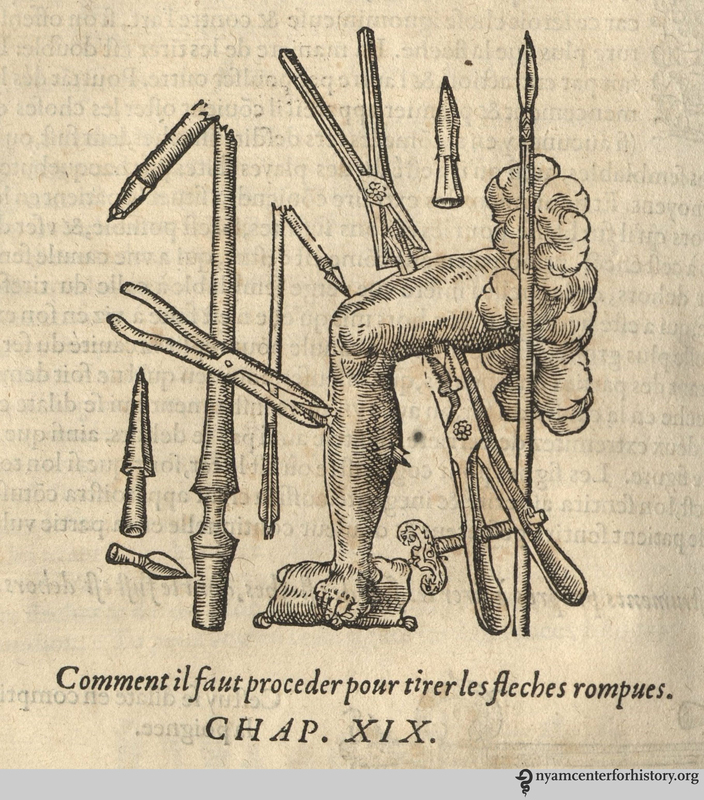 Reminiscent of a “wound man,” this illustration demonstrates techniques for extracting broken arrows from the body. Click to enlarge. A variety of tools for extracting bullets from wounds. On the top left, “crane bill” forceps for fragmented bullets; on right a shorter “duck bill” instrument designed for extracting whole bullets. At bottom, “lizard noses” for drawing out flattened bullets. Click to enlarge. 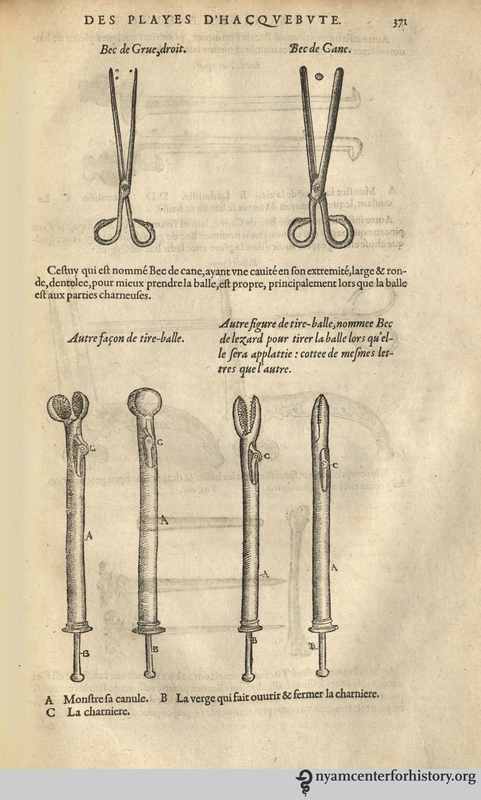 The evidence found in earlier surgical manuals suggests that medieval surgeons had made similar experiments, and that it was the popularity of the more recent ideas promulgated by da Vigo that led to treatments with cauterization and oil.viii While he was not the only surgeon to be working towards more humane and effective treatment of gunshot wounds, Paré became the most well-known and is often celebrated today as the “father” of modern military surgery.ix This reputation rests on not only his work around gunshot wounds but his broad interests, influence, and innovation. A future post will explore other aspects of Paré’s Oeuvres and its long-term impact on military surgery. i. A full bibliography of his works was produced by Academy librarian Janet Doe in 1937. See Janet Doe, A Bibliography of the Works of Ambroise Pare; Premier Chirurgien et Conseiller du Roy (Chicago: University of Chicago Press, 1937). ii. Ambroise Paré, Les Oeuvres de m. Ambroise Paré … Avec les figures & portraicts tant de l’anatomie que des instruments de chirurgie, & de plusieurs monstres. Le tout diuisé en vingt six livres … (Paris : Chez G. Buon, 1575), p399. iii. Paré defended his publication with a written defense and in the Parisian courts. While the verdict was not recorded, the book went on sale and sold out almost immediately. See Wallace B Hamby, Ambroise Paré, Surgeon of the Renaissance (St. Louis: W.H. Green, 1967), pp153-156. iv. Ambroise Paré, Les Oeuvres de m. Ambroise Paré, pp357-359. v. John Pearn, “Gunpowder, the Prince of Wales’s Feathers and the Origins of Modern Military Surgery,” ANZ Journal of Surgery 82 (2012): 240–244, 241; Kelly R DeVries, “Military Surgical Practice and the Advent of Gunpowder Weaponry,” The Canadian Bulletin of Medical History / Bulletin canadien d’histoire de la médecine 7(2) (1990):131-46, p135. vi. DeVries, “Military Surgical Practice and the Advent of Gunpowder Weaponry,” pp141-142. vii. Ambroise Paré, Les Oeuvres de m. Ambroise Paré, p359. viii. DeVries, “Military Surgical Practice and the Advent of Gunpowder Weaponry,” p142. ix. Frank Tallett, War in Context: War and Society in Early Modern Europe : 1495-1715 (London, US: Routledge, 2010), pp108-110. I have our rare book cataloger, Tatyana Pakhladzhyan, to thank for introducing me to American Natural History, a delightful three-volume set by John D. Godman (1794-1830), a physician, lecturer, and naturalist. She initially came across it in our S.132 section, which comprises books on zoology, natural history, and mineralogy (The Academy library has a unique classification system – watch the blog for an upcoming series on our staffers’ favorite sections.) After consulting with our curator, the decision was made to move the book into our Americana collection. 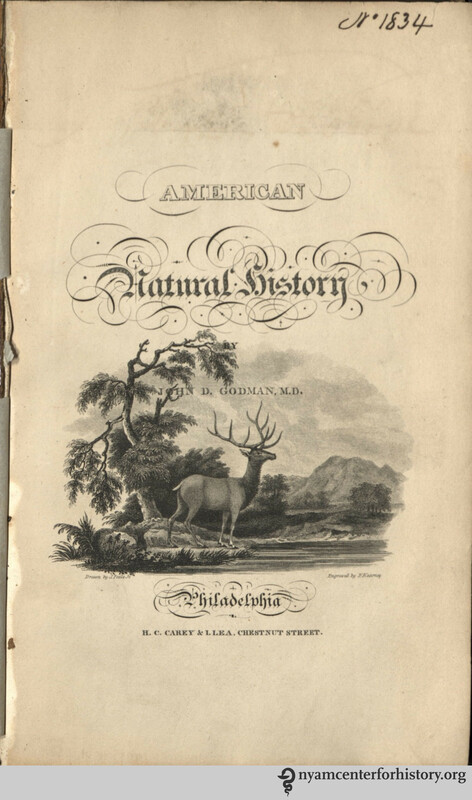 Engraved, added title page in Godman’s American Natural History, 1826-1828. American Natural History is Godman’s effort to document and classify North American mammals. The creatures include wolves, bears, seals, cats, weasels, the domestic dog, and the decidedly American bovine, the bison. The descriptions are accompanied by illustrations depicting the animals with remarkably expressive faces. 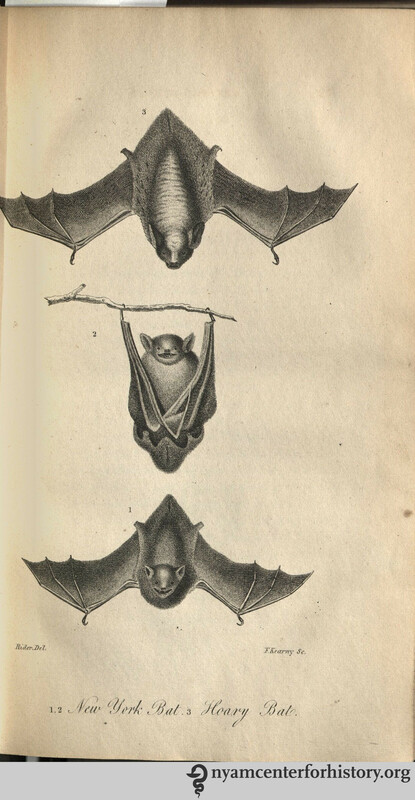 Bats from Volume I of Godman’s American Natural History, 1826-1828. “It has been frequently necessary to suspend it for weeks and months, in order to procure certain animals, to observe their habits in captivity, or to make daily visits to the woods and fields for the sake of witnessing their actions in a state of nature. On other occasions we have undertaken considerable journies, in order to ascertain the correctness of statements, or to obtain sight of an individual subject of description.” (pp v-vi). Title page of Harlan’s Fauna Americana, 1825. Click on enlarge. 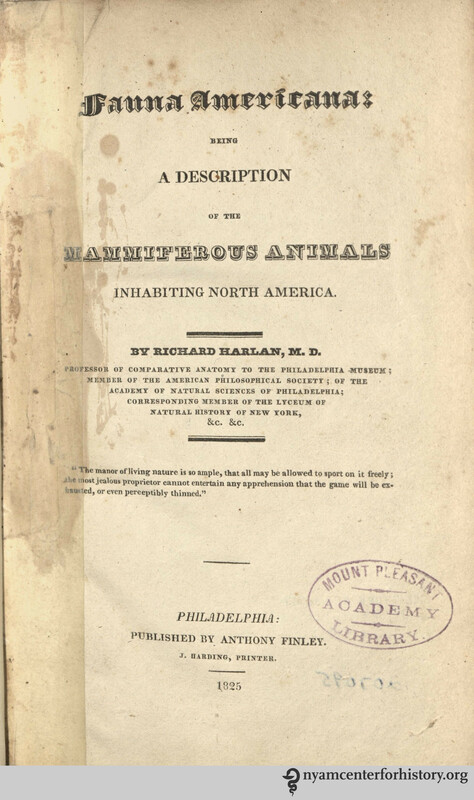 Looking further down the same shelf, we found another early American book on mammals, Richard Harlan’s Fauna americana: being a description of the mammiferous animals inhabiting North America. This was published just a year before American Natural History. Harlan’s book was based on A. G. Demarest’s Mammologie (1820). Godman openly criticized Harlan for this reason and maintained the superiority of his work. A rivalry developed between the two, with Godman generally considered the victor.2 Wesley C. Coe corroborates this in his article “A Century of Zoology in America.” He regards Harlan’s text as “a compilation of work from European writers…[that] had little value,” while Godman’s is an “illustrated and creditable work.”4 Nevertheless, Fauna americana will soon join American Natural History on the shelves of our Americana collection. 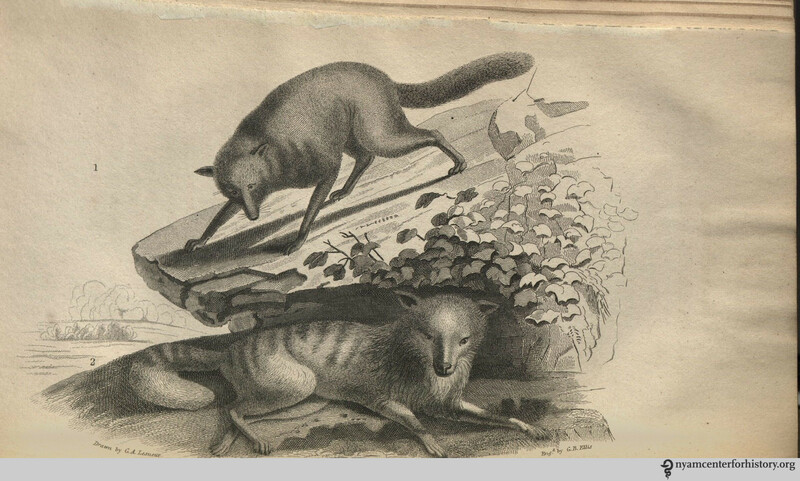 Common wolf and dusky wolf in Volume I of Godman’s American Natural History, 1826-1828. Click to enlarge. 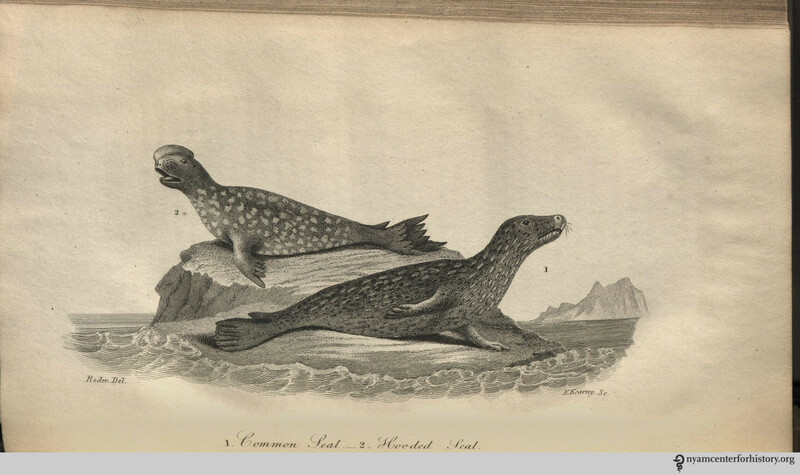 Common and hooded seals from Volume I of Godman’s American Natural History, 1826-1828. Click to enlarge. 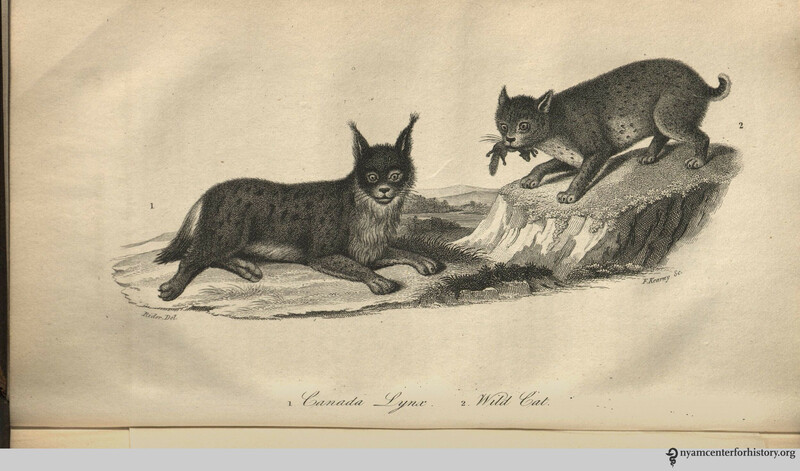 Canada lynx and wild cat in Volume I of Godman’s American Natural History, 1826-1828. Click to enlarge. 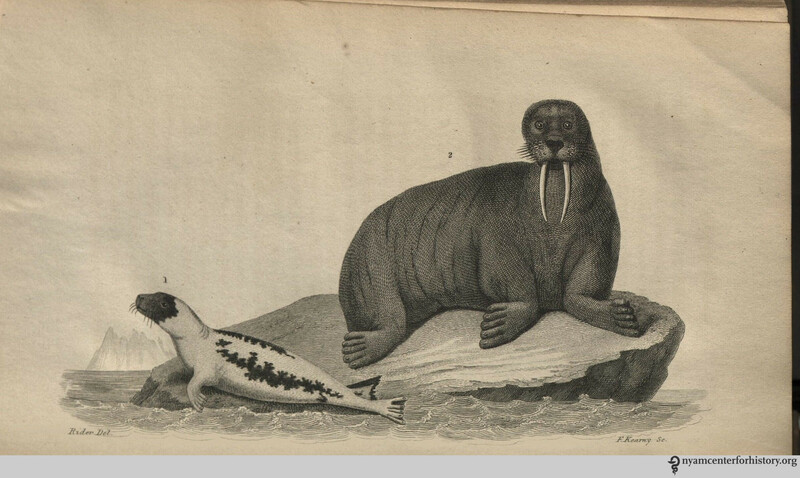 Harp seal and walrus in Volume I of Godman’s American Natural History, 1826-1828. Click to enlarge. 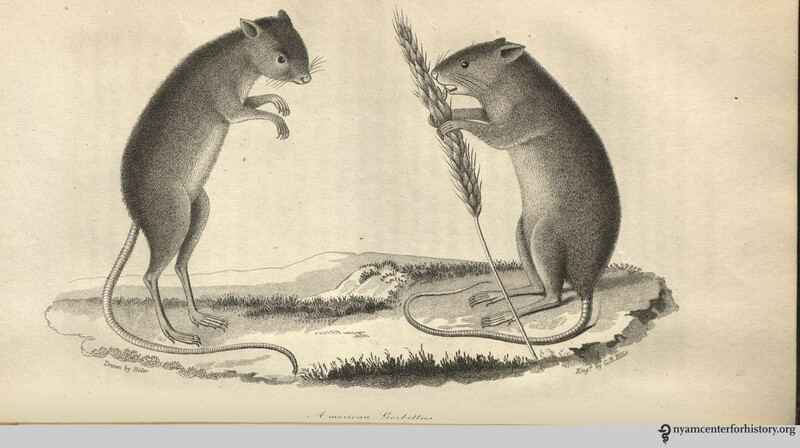 American gerbillus in Volume II of Godman’s American Natural History, 1826-1828. Click to enlarge. 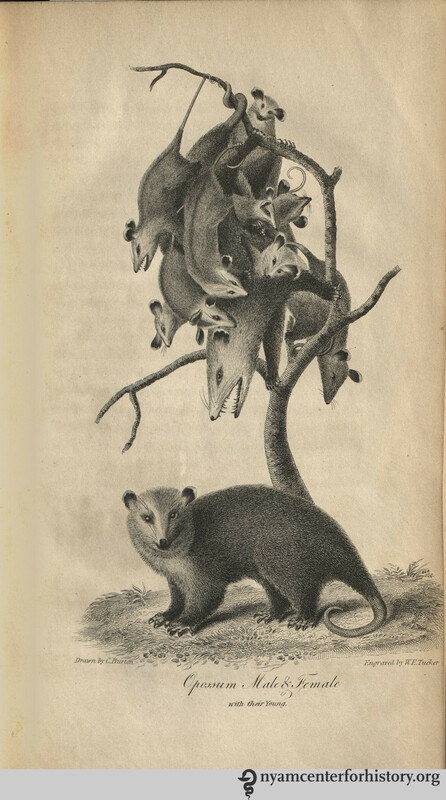 Opossums in Volume II of Godman’s American Natural History, 1826-1828. 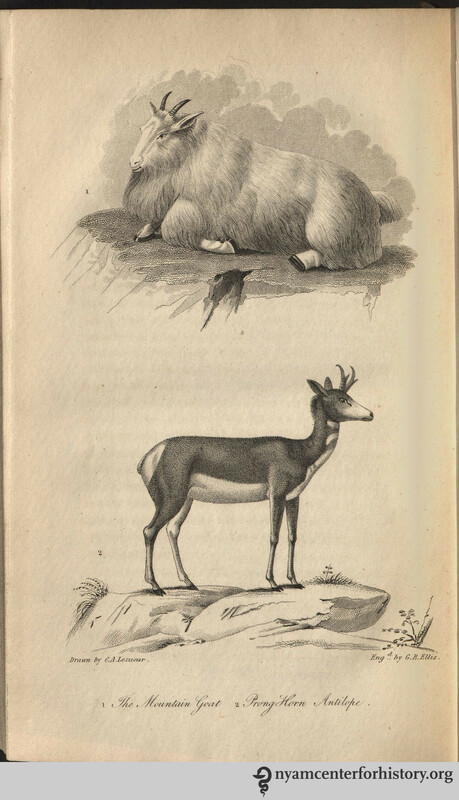 Mountain goat and prong-horned antilope in Volume II of Godman’s American Natural History, 1826-1828. 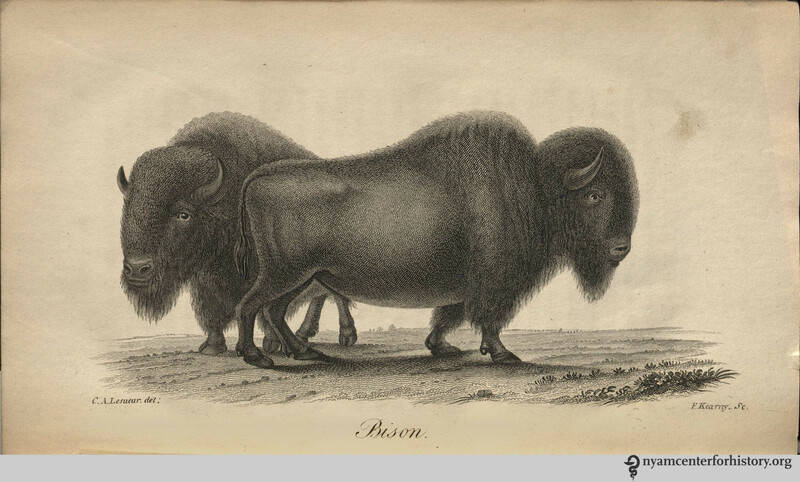 Bison in Volume III of Godman’s American Natural History, 1826-1828. Click to enlarge. 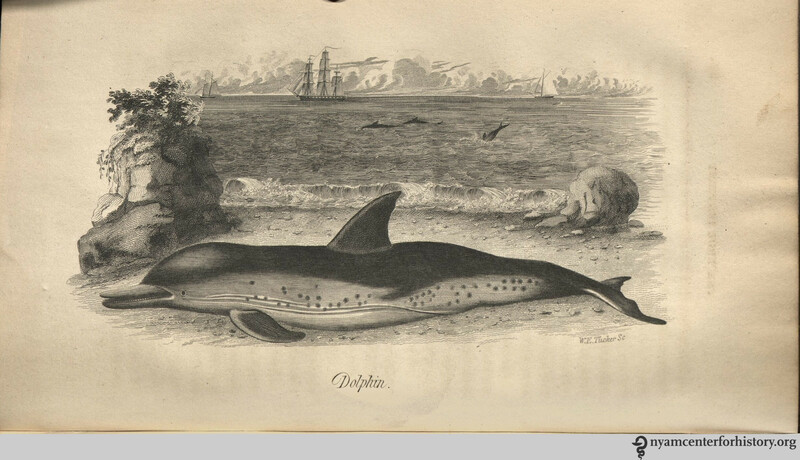 Dolphin in Volume III of Godman’s American Natural History, 1826-1828. Click to enlarge. “Godman, John Davidson.” In Dictionary of American biography, edited by Allen Johnson. New York : Charles Scribner’s Sons, 1931. Rosen, Susan A. C. “John D. Godman, MD.” In Early American nature writers: a biographical encyclopedia, edited by Daniel Patterson, Roger Thompson, and J. Scott Bryson. Greenwood Publishing Group, 2008. Retrieved from http://books.google.com, July 28, 2016. Faul, Carol. “Godman, John Davidson.” In Biographical Dictionary of American and Canadian Naturalists and Environmentalists, edited by Keir B Sterling. Westport, Conn: Greenwood Press, 1997. Retrieved from http://books.google.com, July 28, 2016. Coe, Wesley. “A Century of Zoology in America.” The American Journal of Science series 4, 46 (1918): 355-398. Retrieved from http://books.google.com, July 28, 2016. The New York Academy of Medicine hosted its annual fund-raising gala at the Mandarin Oriental on June 14th. Gala attendees had the opportunity to sample two treats based on recipes from one of our favorite manuscript receipt books. The Academy Library has 37 manuscript receipt books, most of which contain a mix of culinary, medicinal and household recipes. Some of them have been featured already on our blog (see earlier posts on Mother Eve’s Pudding, and English Gingerbread). The Recipes Project also featured an interview with Anne Garner, our Curator of Rare Books and Manuscripts, about the print and manuscript historical recipe books in our collection. One of our favorite manuscripts is A Collection of Choise Receipts from the late seventeenth century. Inspired by a recipe for Black Cherry Water in the manuscript, Pietro Collina and Matt Jozwiak created a signature cocktail, the “Choise Cherry Crush,” for gala guests. You can try your hand at mixing one up if you are so inclined. “Black Cherrie Water,” A Collection of Choise Receipts, 1680. On their way out at the end of the evening, guests received bags with a pair of almond cookies also adapted from a recipe in Choise Receipts. There are several recipes for cookies or little cakes made with almonds in the manuscript. My favorite, “The Lady Lowthers Receipt for to make Bean Bread” a cookie that very much resembles a macaron in texture, takes its name from the slivered almonds that look like little beans that are mixed into the dough. “Lady Lowthers Receipt, for to make Bean Bread,” from A Collection of Choise Receipts, 1680. The recipe for Almond Bisketts that we reproduced for the gala, however, seems to be missing a crucial ingredient: almonds! The front of the recipe postcard produced for our give-away cookies for the gala. Only when examining the full page of the manuscript, on which a very similar recipe for Almond Cakes appears directly above the one reproduced on the postcard, does it become clear that the “half a pound of fflower” referred to in this recipe would be made from ground almonds. The adapted recipe printed on the back of our card makes that clear. The adapted recipe, on the back of the postcard. If you make a batch of these tasty cookies, let us know how they turn out! Better yet, send us a picture and we’ll post it on Instagram. The Drs. Barry and Bobbi Coller Rare Book Reading Room captured by Ardon Bar-Hama. Click for the full panoramic experience. The Drs. Barry and Bobbi Coller Rare Book Reading Room has reopened. Renovations improved environmental conditions for the collections, including a new HVAC system, restored the historic windows, and a return to the cork floor’s former glory. We are once again welcoming readers and visitors to the room and were delighted to have the chance to host the wonderful Ardon Bar-Hama, who kindly captured the space in its full panoramic glory. Click through on the image to see the interactive (and highly zoom-able) panoramic view. Today’s post was written by the 2013 Gladys Brooks Conservation Intern, Caroline Evans. The diploma collection at The New York Academy of Medicine contains over eight hundred certificates, diplomas, seals and proclamations granted by universities, professional societies and institutions across a wide geographical span. The items in the collection range from the mid-eighteenth century up to the late twentieth century. The diplomas were the subjects of a major collections care project carried out in the Gladys Brooks Book and Paper Conservation Lab by Caroline Evans (summer intern), with the assistance of Emily Moyer (Collections Care Assistant) and Allie Rosenthal (volunteer). Piles of diplomas to be sorted, cleaned, and housed. While most of the earlier diplomas are printed or written on parchment and display elaborate calligraphy, many of the later items in the collection are printed on paper. The diplomas can provide a glimpse into the changing methods of printing during this period, as well as into the preservation needs of flat paper—in some cases, for instance, some of the ink in the signatures had begun to flake, and seals on parchment were cracked. In addition to dry cleaning the diplomas and making the appropriate efforts to stabilize each of these items, we constructed folders and housing for each diploma or seal before sorting them by size, date, and granting institution. Over the course of this undertaking, some gems emerged—documents significant to the history of the Academy and to the history of medicine. Among these are certificates nominating and appointing military ranks to fellows of the Academy and other doctors serving in wartime. In addition to signatures from the “Secretary of War”, many of these documents boast signatures from various Presidents of the United States. 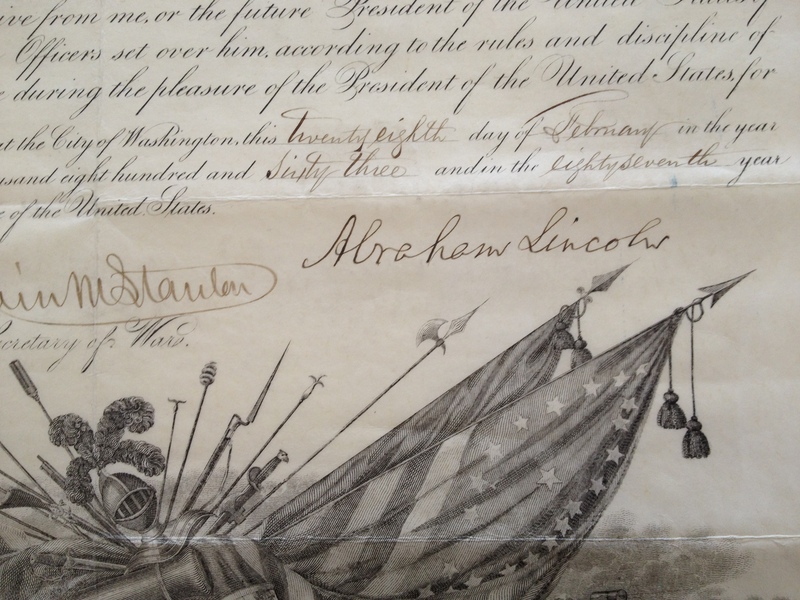 Indeed, while sorting through the collection, we encountered wartime documents—appointments or commendations thanking military doctors for their service—with signatures from Presidents Abraham Lincoln, Andrew Jackson, Andrew Johnson, Herbert Hoover, William Howard Taft, Woodrow Wilson, and Warren G. Harding, to name a few. Certificate signed by Woodrow Wilson. 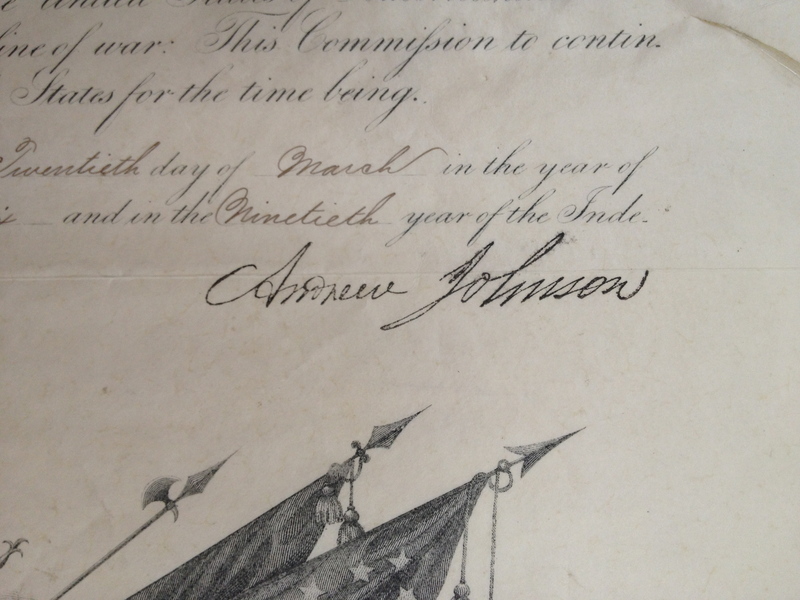 Certificate signed by Andrew Johnson. Certificate signed by Abraham Lincoln. Occasionally found tacked onto the back of certificates and acknowledgments of service were documents indicating the intersection of military service and medical research—for example, a letter from Walter Reed Hospital to a soldier encouraging him to participate in a study on the effect of injections of yellow fever. There are also a significant number of female medical professionals whose successes and contributions to the field of medicine and women’s health are commemorated in the collection. Some of these awards and diplomas are dated as early as the nineteenth century. 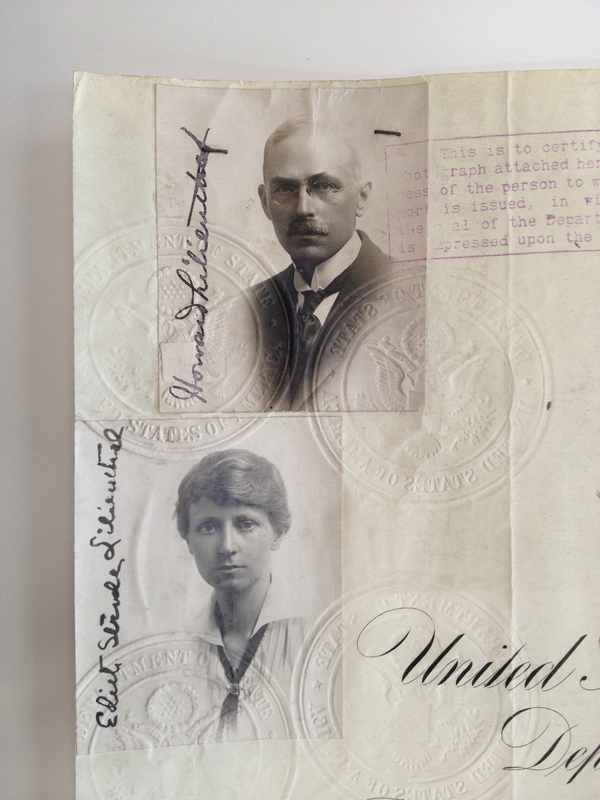 Photographs of Howard and Edith Lilienthal attached to a passport. The diploma collection contains items printed in French, Portuguese, Hungarian, Latin, Hebrew and Arabic that display a variety of design styles. 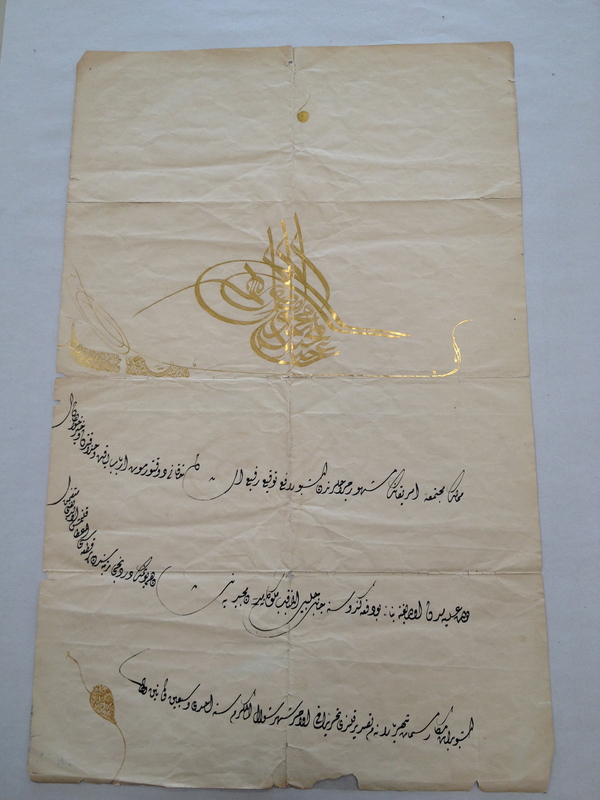 One particularly beautiful certificate from 1945 was granted by the Société Impériale de Médecine de Constantinople, written in Arabic on thin paper with gold leaf. 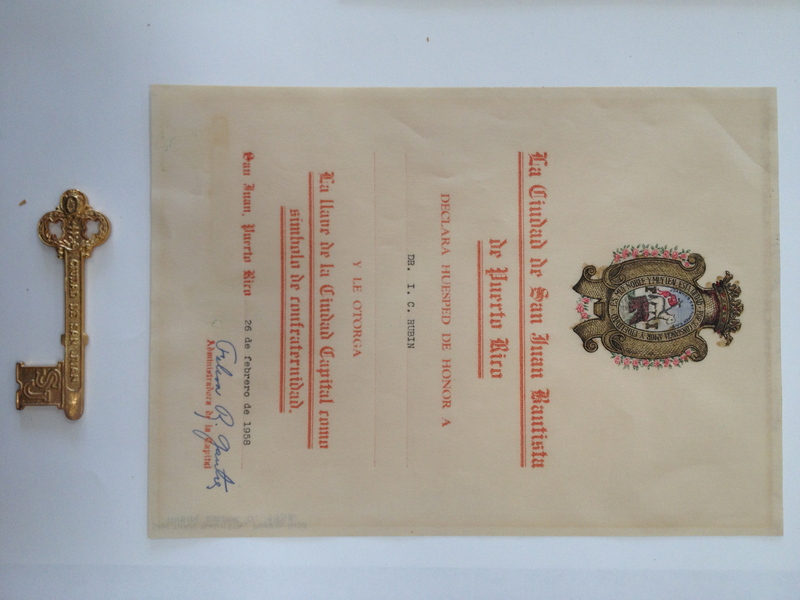 Key to the City of San Juan Batista, granted to Isidor Rubin. 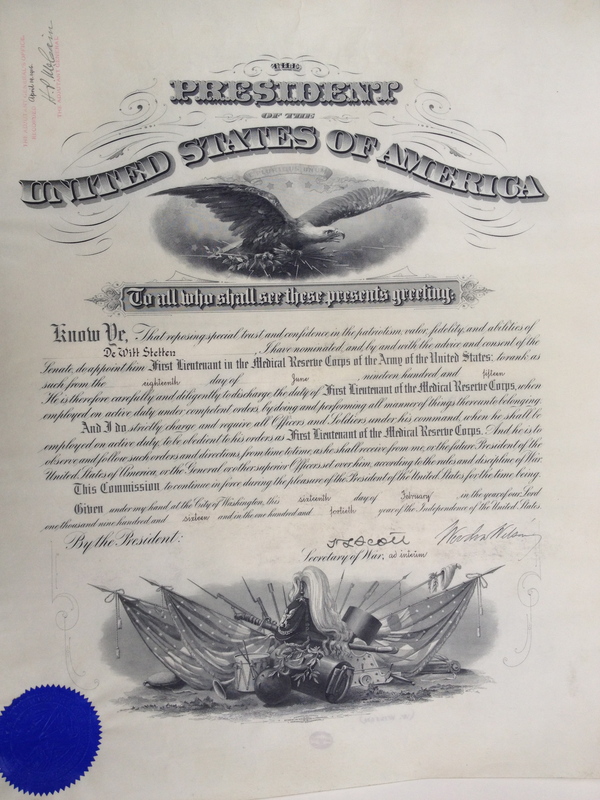 Some more recent certificates are printed in color, with hand-colored borders and modern, stylized type. The diplomas on paper were a special challenge to clean and house, as many of the papers had become brittle or were adhered to acidic backings. 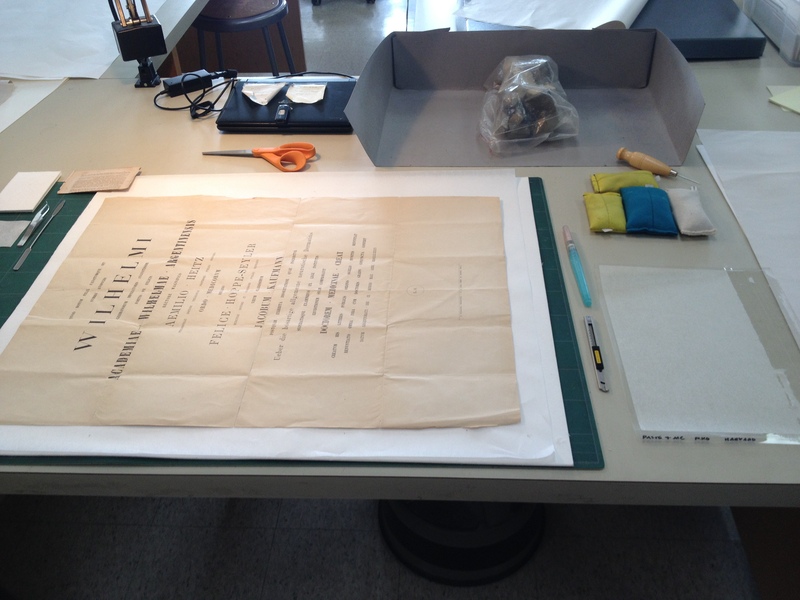 This allowed the aspiring conservators interning and volunteering in the lab ample practice with paper repair. Diplomas printed on vellum provided their own challenges, however, as humidity fluctuations over time caused some of the works to curl and stretch, obscuring and fading labels and printed text. 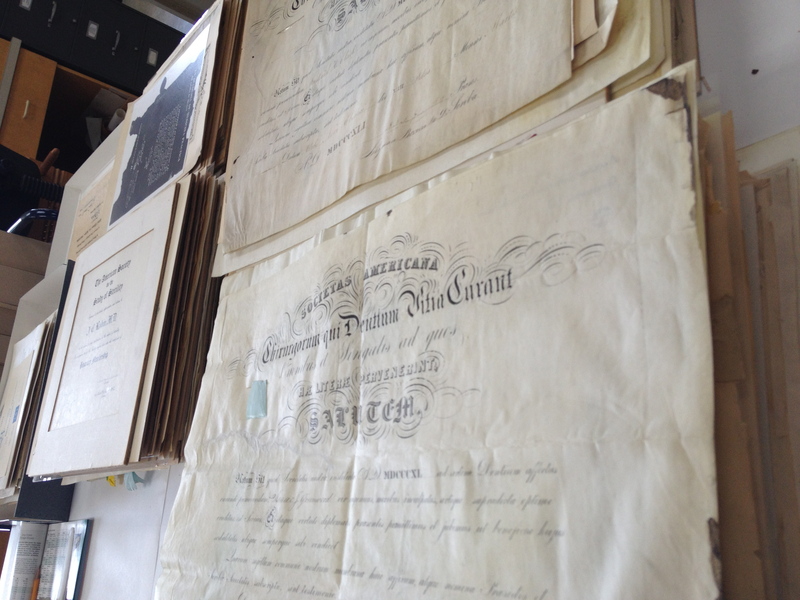 Repairing paper certificates in the conservation lab. These challenges, in addition to the diverse languages present in the collection, necessitated some additional investigation for the creation of new labels for each item. In the end, though, the lab was able to create a location guide with the identifying information for each sorted, cleaned, and re-housed object, so that the diploma collection will be accessible well into the future. 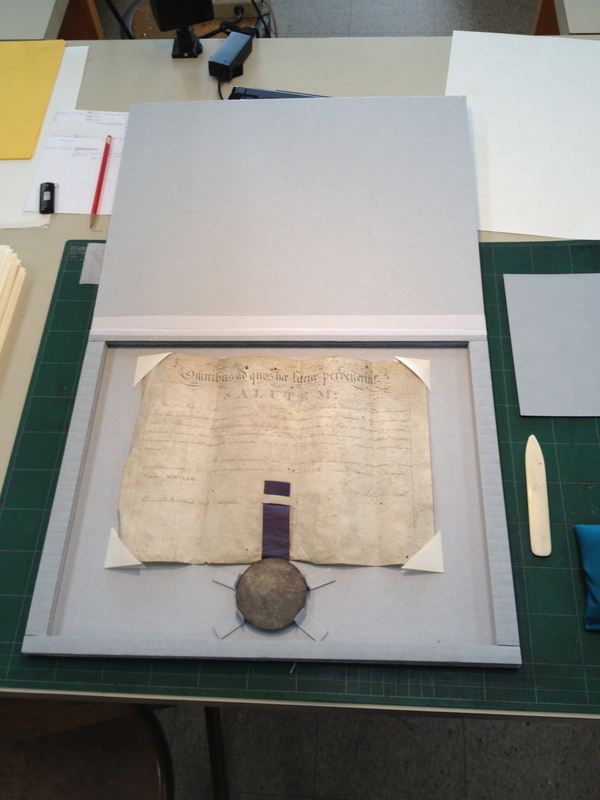 A certificate and seal, re-housed. In today’s guest post, the artist Sigrid Sarda tells us how historical collections inform her work. 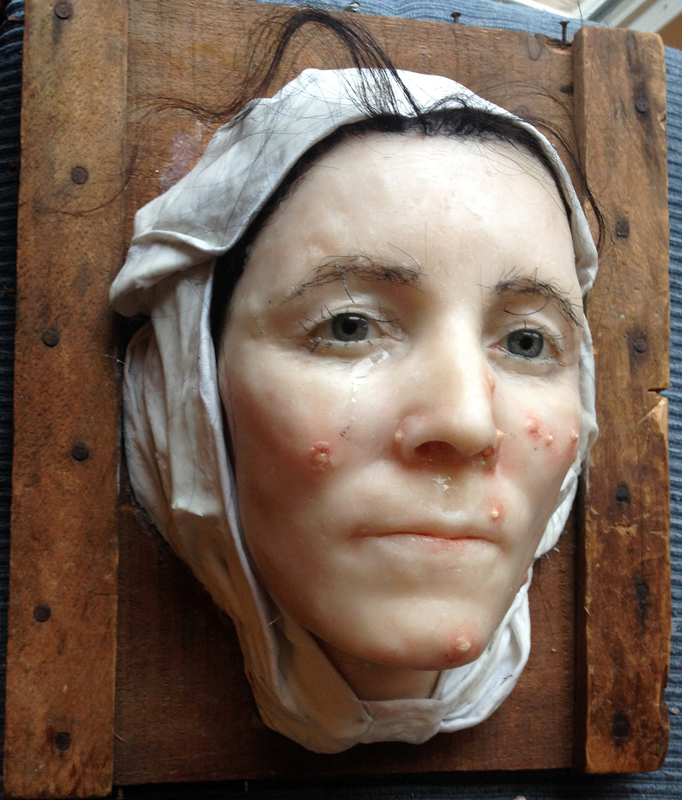 Visitors to our Festival of Medical History & the Arts may have seen her moulages in person, and be sure to visit her blog for information on exhibitions and more of her fabulous work. Earlier this year, I began researching the collections at the Center for the History of Medicine and Public Health. I am an artist/ceroplast, which means wax modeler. The resources I discovered at the Center have been of great inspiration to my work. Sigrid Sarda, “MRSA,” 2013. Wax, Human Hair, Life-size. First, let me tell you about myself. For over 30 years I was a painter. Due to the death of my father and the psychological aftermath I experienced, I ceased painting. In its place, the obsession of the wax figure came into being. Since I was completely self-taught and only worked in this medium for a few years, it was necessary to learn more about its technique and history. Having always had a fascination with religious icons, the body (particularly skin), diseases, and later on death, as well as incorporating human remains such as teeth, bone, and hair in my work, I realized I needed a better understanding of the aesthetics and techniques of wax used in creating these life-size figures and medical moulages. While exhibiting a waxwork in New York City, I met up with Lisa O’Sullivan, director of the Center for the History of Medicine and Public Health at NYAM, and Arlene Shaner, reference librarian and acting curator for historical collections. After discussing the exhibited piece and my ambitions working in wax Dr. O’Sullivan invited me to explore NYAM’s collections. This was an opportunity not to be missed! Upon arriving at NYAM, I was directed to the 3rd floor of the massive Romanesque building where Arlene welcomed me. Delightful, funny, and knowledgeable, she made me immediately comfortable in the surroundings of the library and excited to view the books housed in the collection. She checked out my waxwork, we geeked out on ceroplasts, and spoke about other artists whose work dealt with death such as Joyce Cutler-Shaw. On my second visit, filled with anticipation, I found myself greeted by marvelous books and an actual anatomical wax moulage of a diseased infant. After the initial perusal of my work, Arlene knew what was needed for my research: anatomical images and techniques, and had the books waiting for me in the formidable reading room. As a bonus she brought out the works of M. Gautier D’Agoty, the 18th-century French artist and anatomical illustrator. I pored over both heavily illustrated and non-illustrated books for hours, amassing information for future waxworks. There is truly nothing like the feel of a beautiful book in your hands. The library has become quite the addiction, what with the wonderful staff and superb collection! Below are images from D’Agoty and various books consulted at NYAM, and above is one of my wax moulages. Cowper, The Anatomy of Humane Bodies, (London: 1698). Gautier D’Agoty, Anatomie des parties de la generation de l’homme et de la femme, (Paris: 1773). Le Cere anatomiche della Specola, (Florence: 1979). At our Festival of Medical History and the Arts on October 5, we asked attendees to submit captions for three images from items in our collection. Today, we’re happy to announce the winners of the competition, who will receive high-quality prints of the captioned image. We’ve included original captions with the images, where available, to help show how they appear in context (although the Festival attendees did not get to see them). 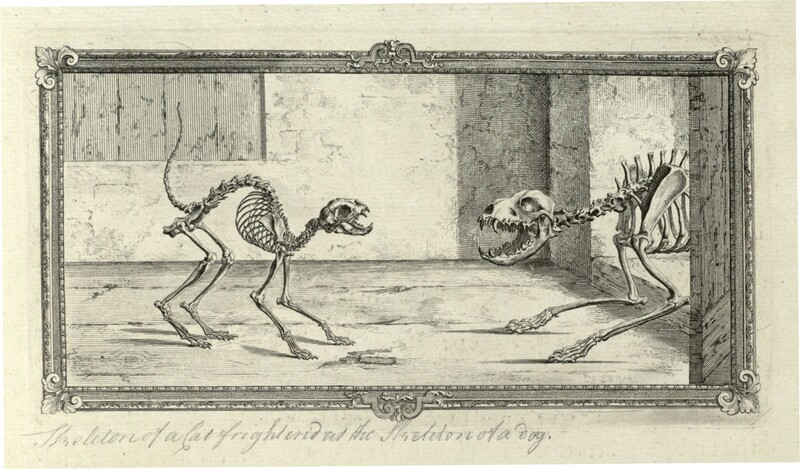 The first image comes from William Cheselden’s Osteographia, or The Anatomy of the Bones, published in London in 1733. Linda Kleinman wrote the winning caption. I’ve had enough of your lip! 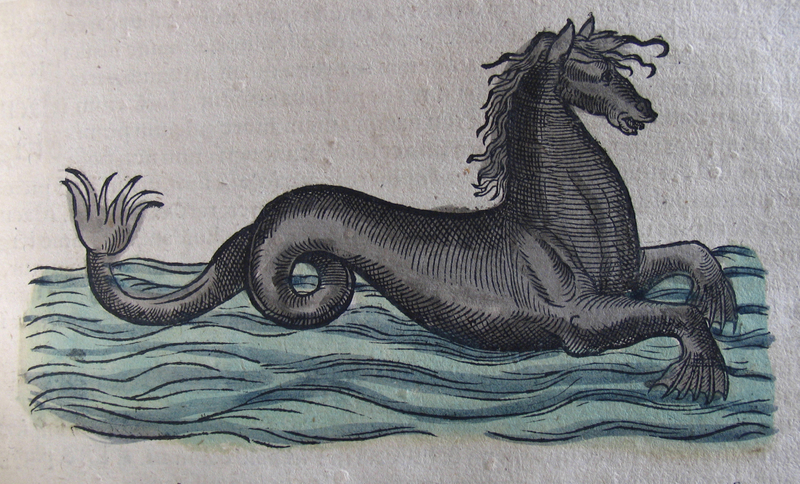 The second image appears in Konrad Gesner’s Historiae Animalium Liber IIII, published in Zurich in 1558. Samuel Luterbacher wrote the winning caption. I knew I should have never trusted Dr. Moreau. 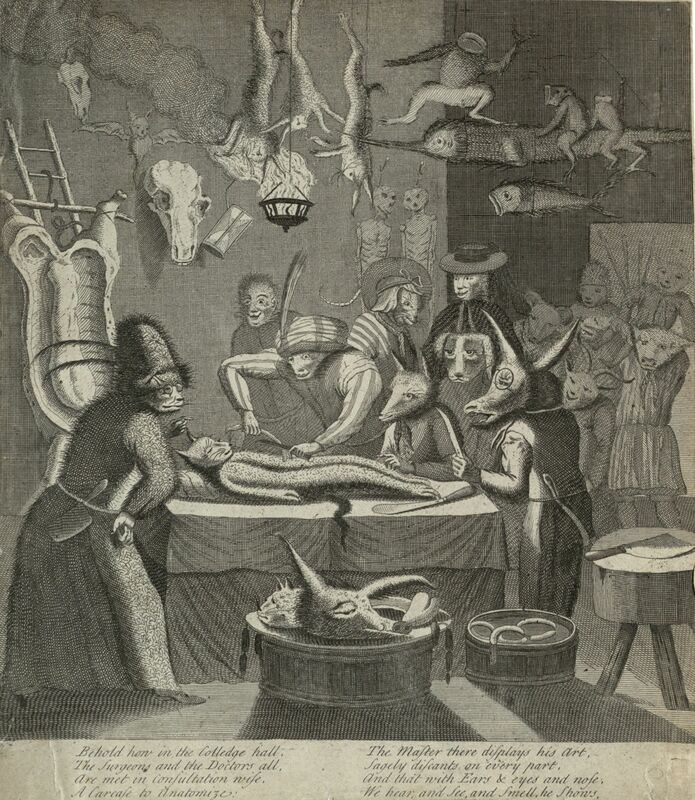 The final image, produced by Egbert van Heemskerck II circa 1730, appears in the George Osborne Mitchell Medical Scrapbook. This picture inspired the strongest pool of captions. But Iana Dikidjieva’s caption stood out from the pack. A note from the Center for the History of Medicine & Public Health: This is the last post in Morbid Anatomy‘s guest series leading up to our Festival of Medical History and the Arts. If you’ve enjoyed these posts as much as we have, don’t despair! Tomorrow’s event holds a full day of lectures and activities from Morbid Anatomy, Lawrence Weschler, and the Center. We hope you can make it! See the full schedule here. The NYAM rare book collection holds a gorgeous copy of the first French edition of Alexander Monro’s (1697–1767) celebrated Traité d’ostéologie … (or “Anatomy of Bones”). Monro was trained in London, Paris, and Leiden before going on to become the first professor of anatomy at the newly established University of Edinburgh. It was under his leadership, and that of his successors, that the school went on to become a renowned center of medical learning. Monro originally published this book without images, thinking them unnecessary after William Cheselden’s lavishly heavily-illustrated Osteographia, or the anatomy of the bones of 1733 (more on that book at this recent post). The very fine copperplates you see here were added to the French edition by its translator, the anatomist Jean-Joseph Sue (1710–1792). My favorite image in the book is a kind of memento mori–themed tableau morte of winsome, scythe-bearing fetal skeletons enigmatically arranged in a funereal landscape (images 1–3). 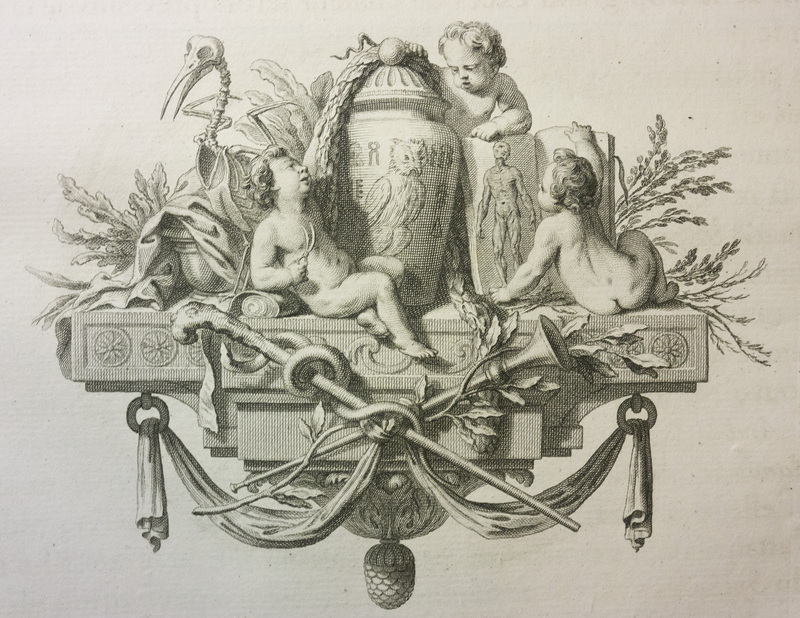 I also love the frontispiece in which a group of plump putti proffer anatomical atlases and dissecting tools under the oversight of a skeletal bird (above). This post was written by Joanna Ebenstein of the Morbid Anatomy blog, library and event series; click here to find out more. All images are my own, photographed at the New York Academy of Medicine.